Hickmans is a traditional High St shop and we believe that seeing, using & discussing your potential purchase in store is essential to ensure you buy the right product. It is for this reason we generally do not sell our products on-line. Our many years of experience installing, setting up and maintaining electrical goods means that you can be confident of your purchase from us, whether it’s an £80 radio or an £8000 Home-Cinema system. Our staff receive regular training from the manufacturers to ensure we are up to date with the latest products & able to provide the best advice. In addition to the items we keep in stock, we’re also happy provide details and information on products that we can order in, to ensure our customers are able to make the best decisions about their new items. Adding to our knowledge on TV & HiFi we are now very proud, once again, to be able to offer our customers a large selection of Domestic Appliances. FREE local delivery and standard installation service is available on many items over £300, plus we can recycle your old item too. We’ve been serving Swindon since 1928 with home entertainment equipment & have a tradition of providing excellent before & after sales service. 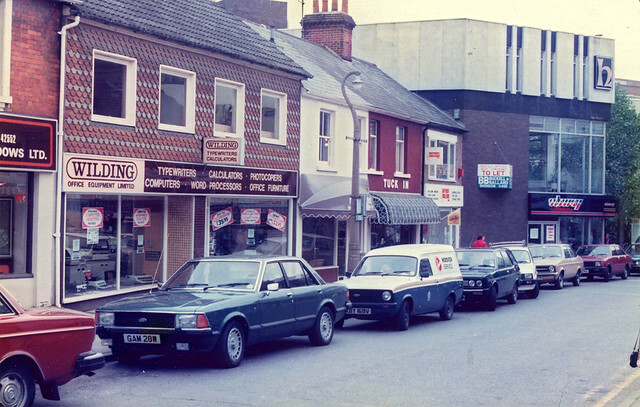 We’ve now been in our current store on Victoria Rd for over 30 years & have become part of the fabric of Old Town. Various bus routes stop directly outside our store making access by bus very straight forward. One of Hickmans former loacations in Havelock Square before moving into the new Brunel Shopping Centre. Arcade inside the ultra modern Brunel Shopping Centre that opened in the late 1970’s. For timetables, please click here.